With the impending release of Star Wars™: The Last Jedi, Fantasy Flight Games is proud to announce their participation in Force Friday II with a new Star Wars product! Fantasy Flight Games has produced a large array of Star Wars™ products, from the X-Wing™ Miniatures Game to Star Wars™: Destiny. Each of these games has not only provided fantastic play experiences, but has drawn tabletop gamers into the very essence of the Star Wars galaxy. Fantasy Flight Games is known for consistently bringing the thrilling feel of Star Wars to players’ table, whether it’s the Millennium Falcon punching through an Imperial blockade in a game of X-Wing, a small but effective team of Rebel operatives destroying a shield generator in Imperial Assault, or training with a lost Jedi master in Force and Destiny™. Now, we are very excited to continue to bring this passion for the epic space saga by participating in Force Friday II, which is sure to be one of the biggest Star Wars events of the year. Force Friday is a global fan event celebrating the release of Star Wars products, toys, collectibles, books, apparel, and more. This year, Force Friday is back in celebration of Star Wars: The Last Jedi products launching on September 1st. This year’s goal is to make Force Friday even bigger and better than ever with an unprecedented global augmented reality initiative: “Find the Force.” This Force Friday, fans are invited to aid the Resistance by taking part in an AR treasure hunt for data chips that hold information about key personnel. 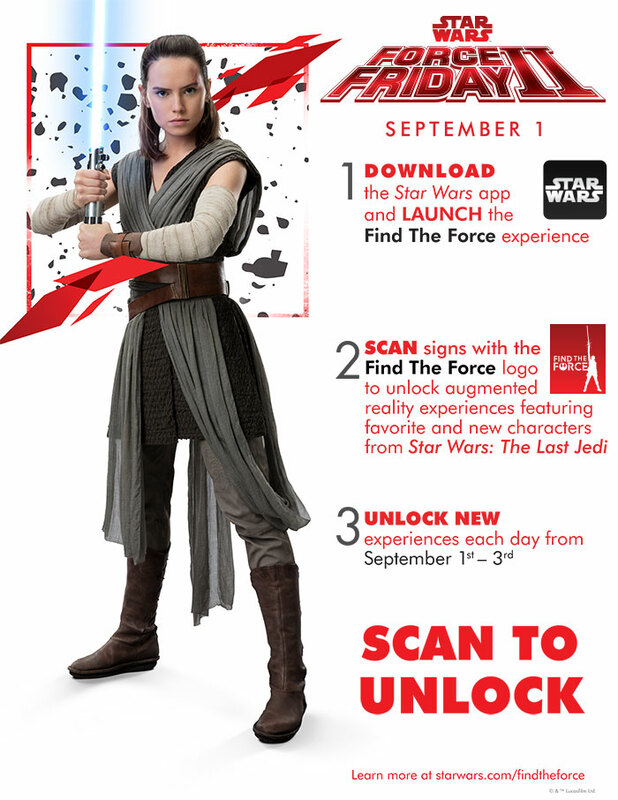 Fans can use the Star Wars app on their phones from September 1st to 3rd to unlock life-size AR characters developed by ILM. Fans can share pictures and videos featuring the characters on social media for a chance to win a trip to the film premiere and product prize packages, including new Star Wars: The Last Jedi prizes. Be sure to check out the Fantasy Flight Games website on September 1st for more information on this new product! Force Friday is a global fan event celebrating the release of Star Wars products, toys, collectibles, books, apparel, and more. This year, Force Friday is back in celebration of Star Wars: The Last Jedi products launching on September 1st.